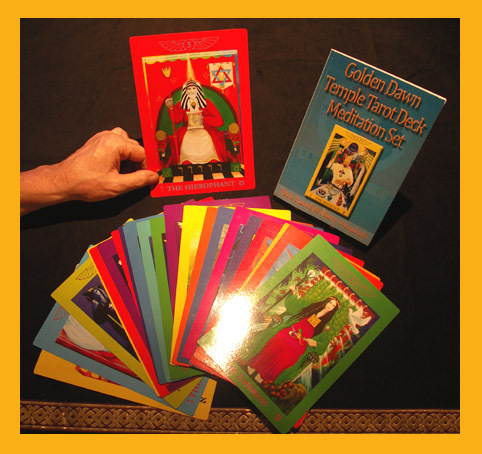 The Golden Dawn Temple Deck Meditation Set comprises a full set of A5 Major Arcana Keys from the Golden Dawn Temple Tarot Deck –23 cards in all, including the two versions of the Temperance Key – with a handbook by Nick Farrell and Harry Wendrich. 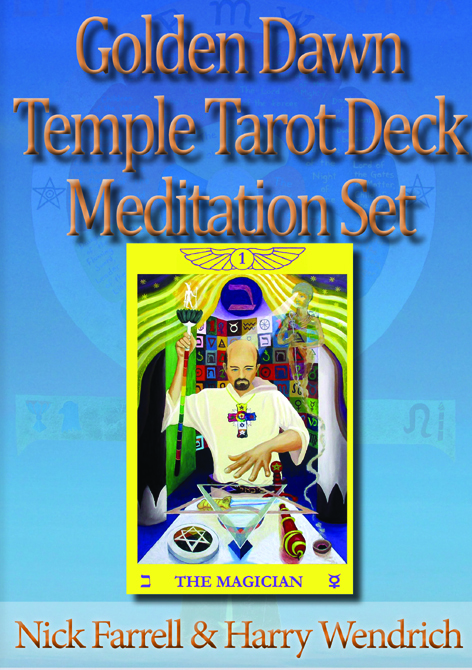 This 100-page A5 handbook is exclusive to this Meditation Set and is not a component of the 80-card (green) deck; neither is it sold separately. Number + Hebrew Name + Colours + Astrological Associations + Archetypal Symbolism + Specific Symbolism = the Key. 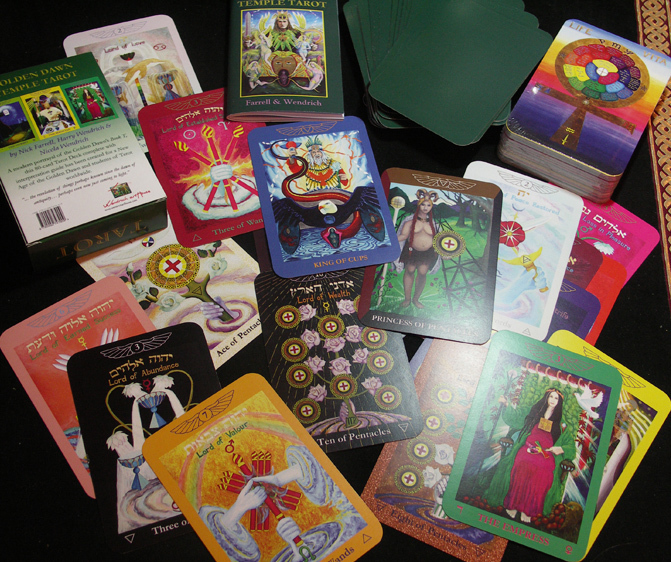 Preparatory exercises and a consecration ritual are followed by several tried and tested meditation techniques whereby you, the reader, can explore how the archetypal Tarot energies function in your life, their relationships to your natal astrological chart, with opportunities to balance energies, learn from past-life scenarios, and also investigate how archetypes function within couples and groups, finishing with a sequence to assist in understanding the process of one’s spiritual unfoldment. The original paintings were purposely sized 70 cm x 100 cm – large enough to generate astral doorways to assist the artists in the creative act of capturing archetypal energies on canvas. The cards themselves are in A5 format (15cm x 22cm). The larger format of these bordered cards replicates the sense of entering a doorway into the inner realms and brings the reader a fuller impact of the magic within the images. 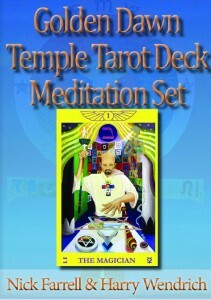 As such the entire deck can be utilised as a set of meditation portals into the archetypal worlds of the Tarot. They are also suitable as Keys for Golden Dawn initiations, and for Major Arcana divinations. 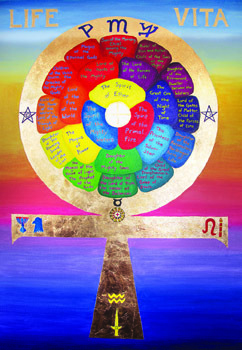 Unlike the full deck of 80 cards with a back cover of racing green, the image on the back of the A5 Mediation Cards (left) depicts the Ankh and the Rose, incorporating the 22 Major Keys of the Major Arcana and their Titles, and the Four Elements of the Minor Arcana, symbolizing the Tree of Life before the Fall. Please note that this special edition of the Major Arcana was published before the full deck of 80 cards, since when, a few alterations have been made in accordance with the insights gleaned throughout the progression of this project. The Judgement Key featured in this deck has the original Golden Dawn colour attribution of Glowing Scarlet-Orange. 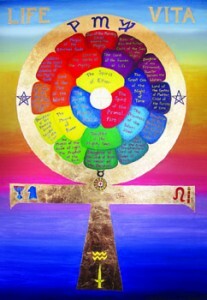 In the full Tarot deck, this Key has been updated according to the modernised colour theory which incorporates Magenta as the true primary for The Spirit of Fire. It is possible to meditate with either version of this Key: it would be of interest to note the differences that the colour makes to the meditation. Full boxed set of 80 cards and booklet.